I love the balance of light and dark colors that he has. 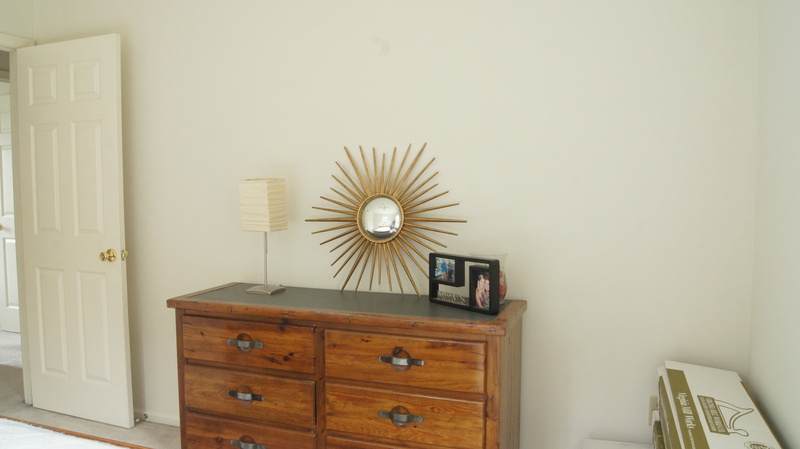 It’s not too jolting, and creates a cool, cozy space. By the way, he has since transitioned to a big boy bed so that we can reuse his crib for baby girl. However, it doesn’t look very good right now, as it’s just a full sized mattress on the floor haha! Maybe I’ll share more details about it when it looks a little nicer in there. 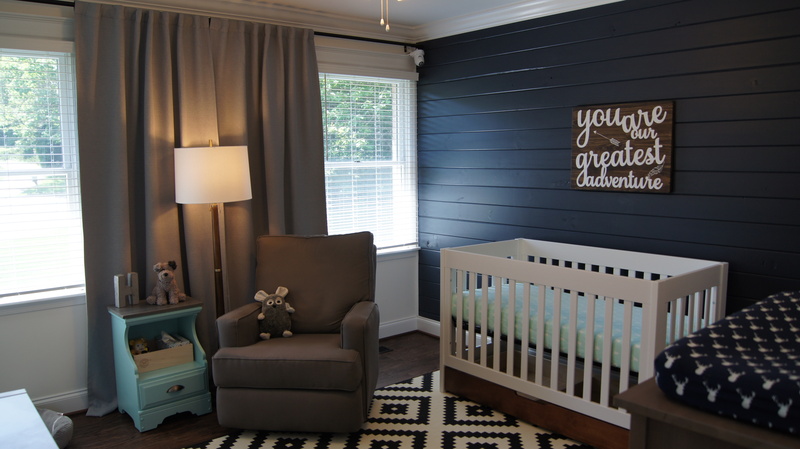 The balance of light and dark worked out so well in Connor’s room, that I really wanted to do it again in baby girl’s room. Plus, I’ve been seeing pictures like these lately and just really falling in love with hunter green, too. I mean, I know this is a kitchen, but is it weird to say that it inspired me for the nursery?? I could literally DEVOUR everything that Studio McGee creates. ALL the heart eyes. Now, I wasn’t quite ready to take that green and paint a wall that color. I think Connor’s accent wall looks amazing in navy blue, but the thing is, I think if you have an accent wall in a bedroom it should go behind the bed/crib/headboard. 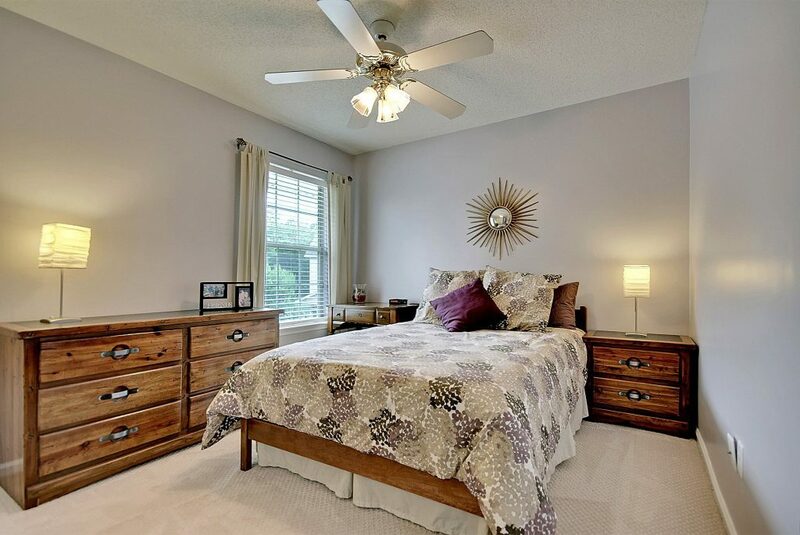 And it’s definitely my total preference to walk into a room and have the crib/headboard on the wall that faces you, so you’re walking up to the bed, and not around it, like Connor’s above. 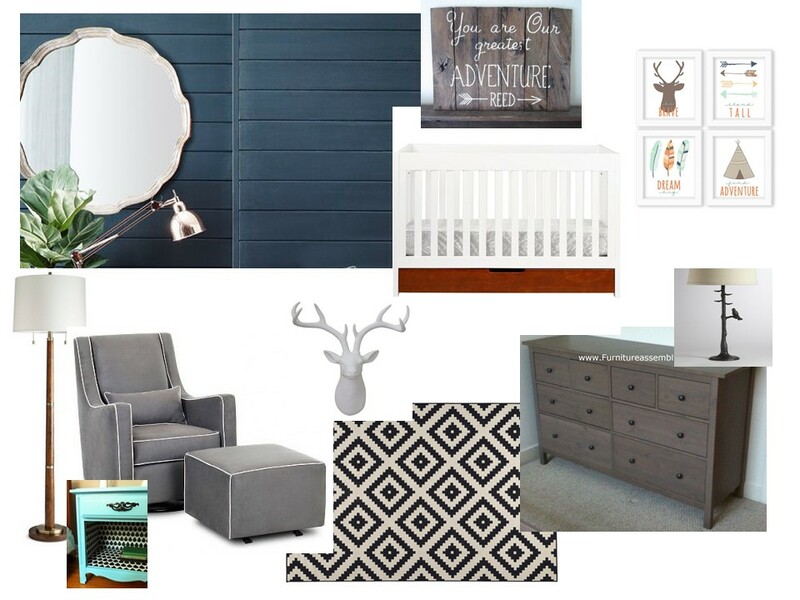 Unfortunately, it’s just not going to be feasible yet for baby girl’s room. This picture is when you walk straight into her room. 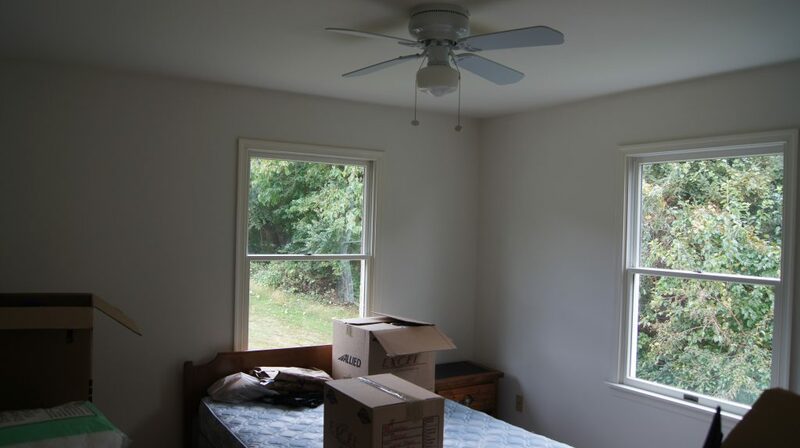 As you can see, the walls that would allow you to walk up to the bed BOTH have windows on them, and I just really don’t want to put a crib anywhere near a window for safety reasons. Yes, we have cordless blinds, but I just really want to eliminate anything that she could potentially yank down and hurt herself. Plus, I love me a good drape! So, eventually, when she is old enough and has a big girl bed of her own, we’ll be able to position it in front of one of those windows with no worries. For now, her crib is going to have to go on the wall to the left when you walk in the room, which is also unfortunately the wall that is shared with Connor’s room. PLEASE tell me that’s not a terrible idea?! I’m having nightmares of future sleeping nightmares. 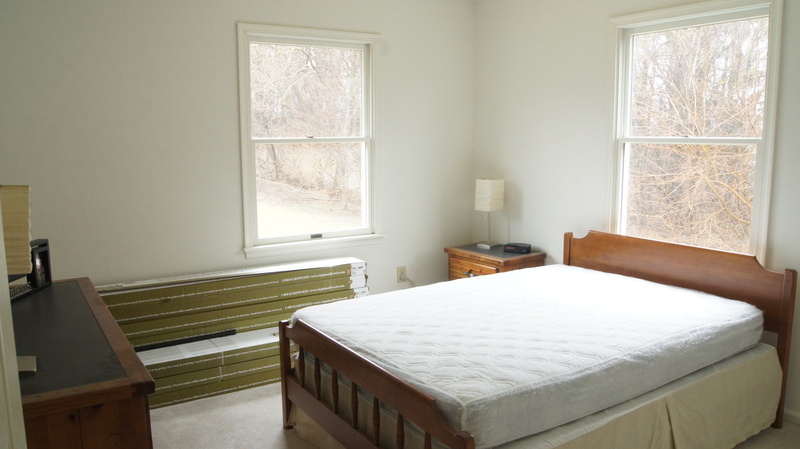 So, the TLDR version: I’m painting the walls a neutral beige, and going for hunter green accents! Here’s the preliminary plan! 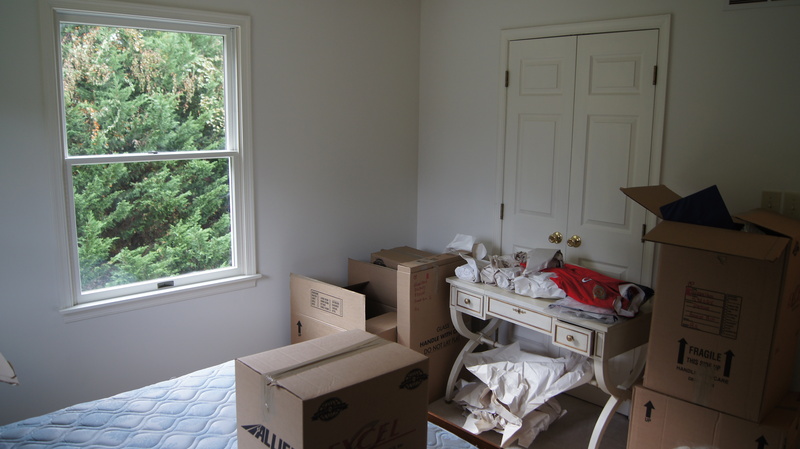 Once I decided that the walls were being painted beige, I knew I wanted some kind of darker green drapes. 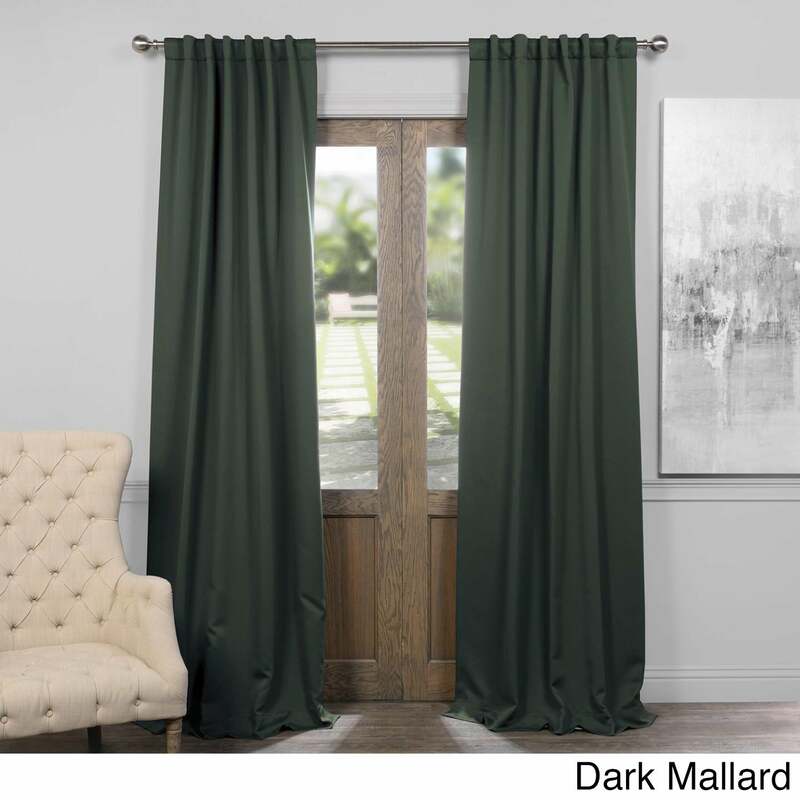 I found these fabulous ones on Overstock.com in “dark mallard”. All I had to read was “mallard” and I was sold. 4 panels bought. She’ll get the crib, glider, and lamp hand me downs from Connor’s room. No point in buying new ones! I think I’ll be sewing her new crib sheets and changing pad covers. 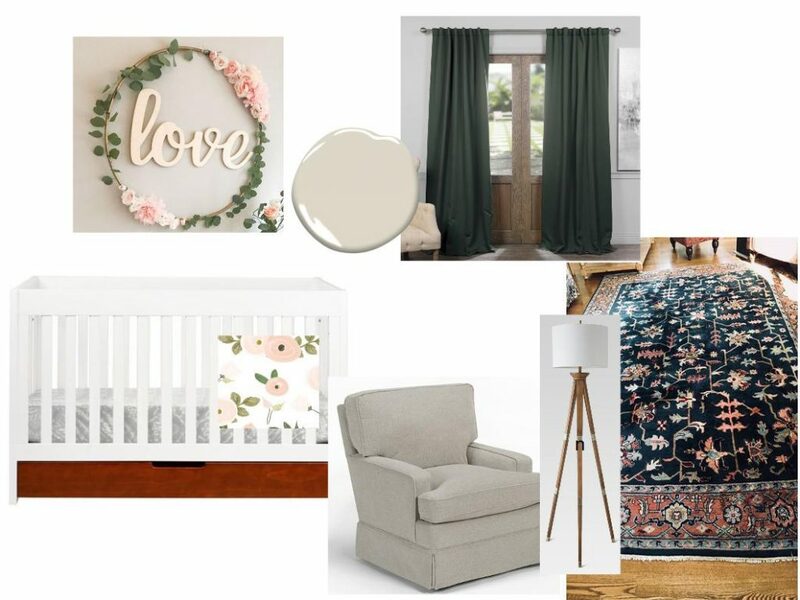 I LOVING the pink and green floral patterns out there, but will wait until I get the rug in there to decide if that would be too busy or not. SPEAKING OF THAT RUG. THAT GEM. I found that on a local Facebook resale page for $70!!! AND it’s 100% wool AND 8×10. I’m SO freaking excited. 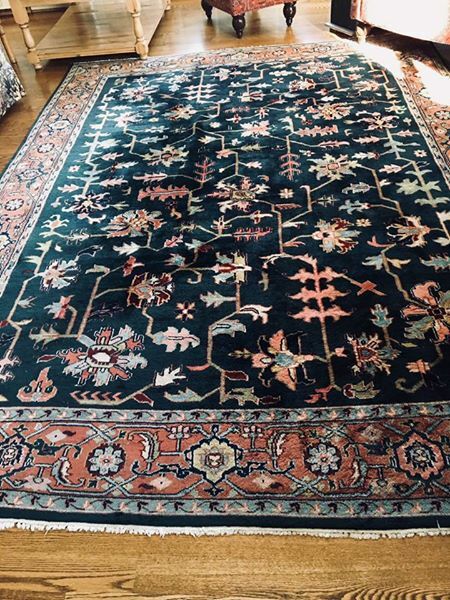 I’m NEVER that lucky with rugs, or just great deals in general. Just look at that hunter green color in there. HEART EYES. Ugh, can’t get over it. It’s currently living in the family room until we finish up the flooring and base molding. And last but not least, that hoop over the crib. 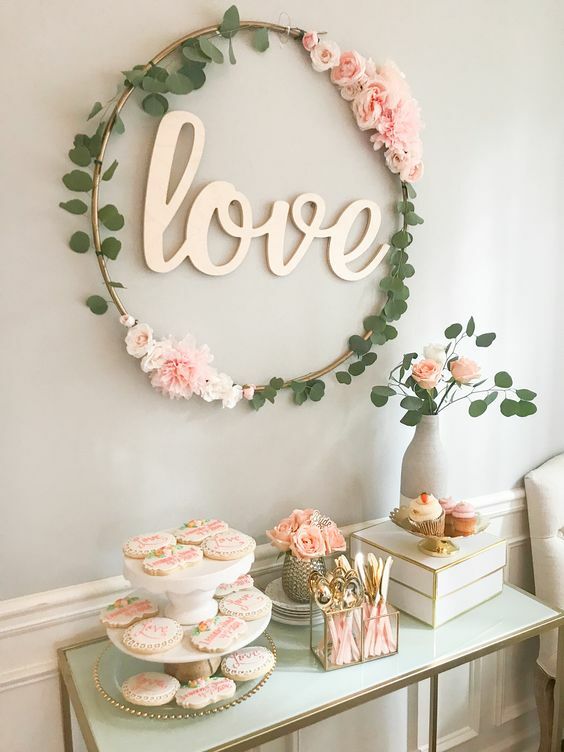 I’ve been stalking Pinterest over some kind of green and pink/coral floral thing for over her crib, and I think I’m headed this direction, except with no words in middle. Of course, all of the options on Etsy are like $60+, so I’ll most likely be DIYing one. I’m sure it’s not going to be all fancy with felt flowers and all, but it’ll do, haha. So that’s what I’m thinking. 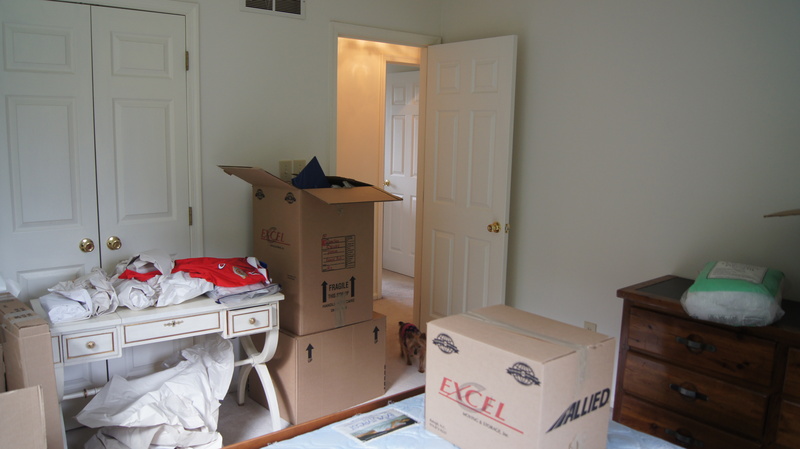 And here are those lovely, juicy “before” pictures from just after we moved in. Cover your eyes. 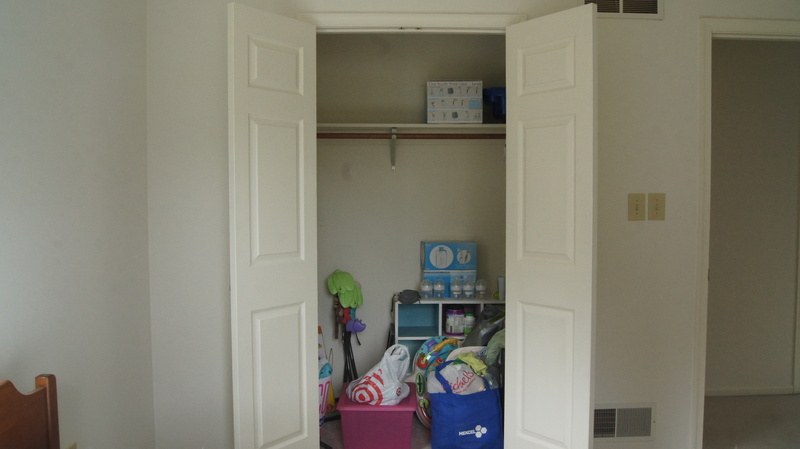 Andddd… baby crap storage closet haha! I’m also considering reusing that dresser and side table above for the nursery. They were hand me downs from my parents, but are pretty solid and sturdy. 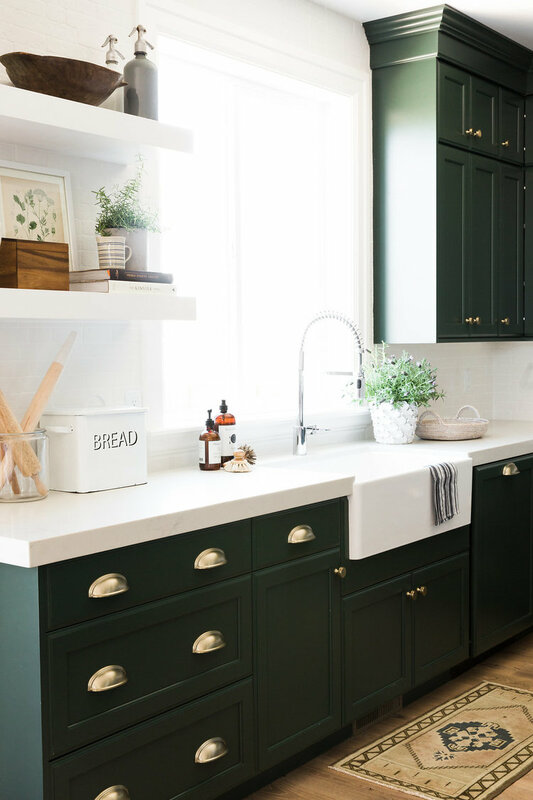 Although I’m not usually a fan of wood grain on furniture, I think a wood dresser actually may look nice with the hunter green and pink/coral colors. I’m just worried that they’re a little too orangey. We’ll see what happens when I pull them all together. What do you think?? I’m so excited, but am all ears for your thoughts/opinions/suggestions!